Bloemfontein - University of Pretoria saw their top-eight aspirations take a blow as they let slip a 2-0 lead to eventually draw 2-2 against Bloemfontein Celtic at the Kaizer Sebothelo Stadium on Sunday. AmaTuks took a two-goal lead into the break thanks to strikes from Denver Mukamba and Geoffrey Massa, but Phunya Sele Sele hit back in the second half as Bevan Fransman and Lerato Lamola fired home within seven minutes of each other. The result left Tuks still 10th in the standings, below ninth on goal difference, while Celtic moved up to fifth with just six games remaining this term. Gregory Maasdorp forged the first chance of the game after seven minutes but was unable to keep his effort on target as he blazed over the crossbar, while Mpho Matsi looked for a response but saw his header from a corner cleared off the line. Musa Nyatama was then also denied by a block after the ball had fallen kindly at his feet from another set piece, but with 17 minutes gone Tuks found the breakthrough, Mukamba somehow squeezing the ball home directly from a corner. Massa then looked to double the visitors' lead midway through the first-half but saw his free-kick just clear the bar, but only two minutes later he got his goal, unleashing a blistering effort which left Patrick Tignyemb no chance. Tuks almost made it 3-0 in the closing stages of the first half as Mukamba's initial effort was spilled into the path of Massa, but he saw his rebound shot crash off the woodwork. 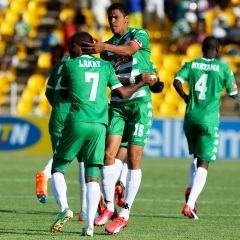 Thapelo Morena tried to get his side back in the game after the restart but was unable to keep his shot on target, although with 51 minutes gone on the clock they pulled one back, Fransman with the simplest of tap ins to make it 2-1 after Lyle Lakay's free-kick had come through a crowd of bodies. Just seven minutes later and Celtic were back on level terms, substitute Gabadinho Mhango playing the ball through for Lamola, who duly slotted home the equaliser. Mhango almost turned from provider to scorer a few minutes later but was unable to keep his fierce shot down as Celtic continued to boss the second period, while Nyatama was also off target as he sent a first-time hit screaming just over the bar.